With the installation of WSUS (Windows Server Update Services) or WebAdvantage on the same server causes a conflicting issue with two new IIS Modules installed top level (from WSUS being installed). These modules then propagate down through IIS websites thus affecting other sites ability to operate, thus resulting in HTTP Error 500.19 – Error Code 0x8007007e. 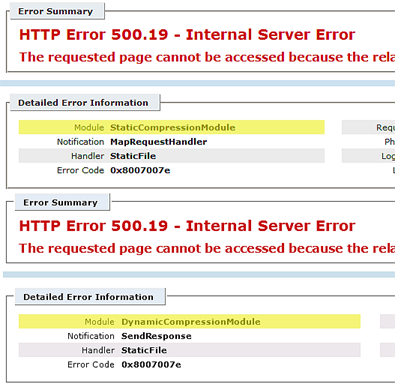 The two modules in question are locked by default and propagate down the PMP Site others within IIS. 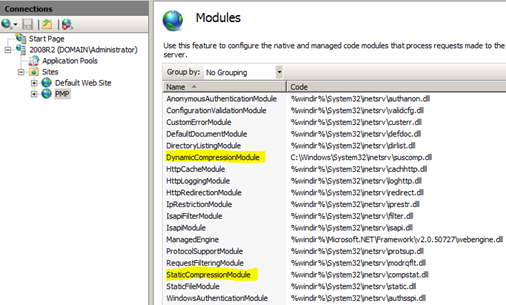 The Modules added globally are DynamicCompressionModule and StaticCompressionModule. We have to remove these from the Default PMP Site created for WebAdvantage. With the following Commands run at the command prompt, you can create a backup within Windows for IIS’ applicationHost.config file. a. At the command prompt run the following command without the brackets [%windir%system32inetsrvappcmd.exe add backup "My Backup Name"] (you can change the name of this backup to whatever you like). Running this will back up your applicationHost.config. b. This creates backup files within the directory called C:WindowsSystem32inetsrvbackup called, in this case "My Backup Name." a. Open up the IIS Manager, notice Connections and then click on your Server Node (top level). Next in the right-pane look for Modulesthen double-click Modules. e. You will notice both DynamicCompressionModule and StaticCompressionModule are in the list of Modules. Right-click and selectRemove both DynamicCompressionModule and StaticCompressionModule. WebAdvantage does not use any compression scheme to run as these disrupt the normal behavior of WebAdvantage. f. Lastly. To reset IIS, click Start, click ALL Programs, click Accessories, right-click Command Prompt, select Run as administrator, at the command prompt type iisreset, and press ENTER. Wait for the action to complete. The above actions restore WebAdvantage to working order and thus allow the WSUS application to continue functioning with no changes to the program directly.